GroupLens externs with some of their favorite foods. Guest written by Maryam Hedayati, Steph Herbers, Sophia Maymudes, and Anna Meyer. Christmas is almost here. Do you know what most people won’t be doing on December 25th? Writing online restaurant reviews. Let’s dive deeper into the world of online restaurant reviews to learn more about this and other interesting trends. Yelp is an online content-sharing platform designed to help people find local businesses, including restaurants. Yelp users (“yelpers”) post reviews and/or photos of businesses they visit. Each review includes a rating (out of 5 stars) and text (that ranges from very brief to long and rambling). Yelpers can also upload photos without posting a review. Yelp shows an overall rating for each establishment, as well as information about its location, price range and cuisine types. We focus our analysis on restaurants from Minneapolis, Seattle, and Houston, since the large populations of these cities and their relative geographic diversity creates an interesting dataset. In this analysis we examine over 3,500 restaurants, 280,000 reviews, and 130,000 photos. Below, we explore this data with a particular focus on how yelpers use photos in their reviews, and differences between locals and tourists. Restaurant reviews are particularly rich with photos of plates of food, menus, people, and indoor and outdoor spaces. The rate at which photos are uploaded has been increasing steadily over the past ten years. Since 2007, the number of photos uploaded to Yelp per day in our dataset has increased drastically, from around ten photos per day to anywhere between fifty and a hundred and fifty. More photos are posted to Yelp during the summer than during any other season. Late July and early August are especially popular: seven out of the ten most popular dates to upload photos are between July 23rd and August 15th. On the other side of the scale, December is clearly the least popular time to upload photos to Yelp. Excluding leap day, the seven least popular days to upload are during that month. And the least popular day of all? December 25th (it’s not even close). Number of photos uploaded per day in our dataset (left), number of photos by month (right). The cuisines that attract the most photos in this analysis serve Japanese food or desserts — dishes that are often plated in a careful and photogenic way. The cuisines with the fewest photos involve types of food in which careful plating is not a priority, including several varieties of fast food. Example photos from Zen Box Izakaya, an example of the most photogenic cuisine (left) and Cedar Inn, an example of the least photogenic cuisine (right). Both are well-reviewed restaurants in Minneapolis. We are curious to learn more about this seemingly strong dislike for chicken wings across cities. After some investigation, we found that almost all of the lowest rated chicken wing restaurants are from multiple branches of four chain restaurants: Pizza Hut (average rating 1.6/5), Domino’s Pizza (average rating 2.0/5), Popeyes Louisiana Kitchen (average rating 2.2/5), and Buffalo Wild Wings (average rating 2.4/5.0). Out of curiosity, we looked to see if chain restaurants are lower rated than non-chain restaurants, and found that while the average review for restaurants with 1 branch is 3.8/5, restaurants with 2-4 branches have an average rating of 3.5/5, and restaurants with more than 5 branches have an average rating of 3.0/5. Yes, on average, chain restaurants are lower rated. How do reviews with photos compare with reviews without photos? We find that reviews with photos are more positive about the restaurant, but not by much. The average rating of a review with one photo is 4.1/5, as opposed to 3.7/5 for a review without a photo. However, adding more photos beyond one doesn’t correlate with more positive star ratings. We also see a trend correlating longer reviews with more photos: while the median review without a photo is 77 characters long, the median review with three photos is 146 characters long. Plots showing the relationship between the number of photos in a review and rating (left), and length of the review in words (right). Restaurant reviews and ratings have an interesting geographical component: restaurants have a physical location, and the people writing reviews have travelled some distance to visit them. How does location proximity and familiarity affect the practice of writing reviews? In this analysis, we examine how tourists’ reviews are different from non-tourists. To categorize each review as local or tourist, we use the user-provided home city and state that appears next to their reviews; we define locals to be anyone who lives in the same state as the restaurant they are reviewing. The graph below shows that in each city, the average restaurant has around 80% of its Yelp reviews from locals. We also see that there is a wide range of restaurants in terms of the touristyness of their Yelp reviews. Further, the more popular a restaurant is (defined by the total number of reviews), the smaller the proportion of its visitors who are locals. The distribution of how many of a restaurant’s reviews come from locals, by geographic location (left). The relationship between the number of reviews for a restaurant, and the percentage of those reviews from locals (right). Tourists post more photos than locals, but not by much. They are somewhat more likely to have one or more photos in their review (24.5%) as compared with locals (19.7%), and they post slightly more photos overall (0.36 photos per review) as compared with locals (0.31 photos per review). By looking at the fraction of reviews from tourists, we can measure which restaurants are the most and least “touristy”. Of the restaurants in our dataset, two restaurants in Pike Place Market in Seattle win the touristy award: both Pike Place Chowder and Piroshky Piroshky have only 5% of their Yelp reviews posted by Washington residents. In Minneapolis, The News Room and Stone Arch are the most touristy: only 26% and 21% of reviewers are locals. In Minneapolis, the least touristy restaurants are in the suburbs, which makes sense since fewer tourists venture far outside of the city limits. Of the restaurants in Minneapolis or St Paul proper, May’s Deli and Pho and Wagner’s Drive In are the most locally-oriented: over 96% of their reviews come from in-state residents. To learn which restaurants most divide the opinions of tourists and locals, we looked at all restaurants in our Minneapolis dataset with at least 20 each of tourist and local reviews (of which there are 272). Examples of restaurants that tourists rate much higher than locals include Keys Café and Bakery and Wild Onion, while examples of restaurants that locals rate much higher than tourists include Homi Mexican and India House. More broadly, tourists to Minnesota judge the Thai, Vietnamese, Mexican, and Japanese restaurants (especially sushi bars) more harshly than locals do. The average tourist gives a higher rating than the average local to most cuisines though, particularly burgers joints, wine bars, pubs, cafés, and New American restaurants. This is markedly different from other cities: in Houston, tourists like the Tex-Mex, Mexican, and seafood choices more than locals, but are relatively judgemental of pizza places. In Seattle, tourists like seafood and New American restaurants much more than locals do. How reviewers rate restaurants in their home city, as compared to how they rate restaurants in other cities. We have a few theories for why hometown restaurants may get a bad rep. The allure of travelling may make people more inclined to like the places they dine because they are new and exciting, or after a long day of travelling the food just seems to taste better. Maybe the most logical explanation: those who travel out of town search for the best restaurants to dine for the short amount of time they have in the city, while locals have time to try restaurants that everyone may not be raving about. We would like to thank Max Harper for hosting us as externs and his guidance and encouragement throughout our research. To everyone else at GroupLens, thank you for your kindness while welcoming us into the lab and giving us a glimpse into grad school. 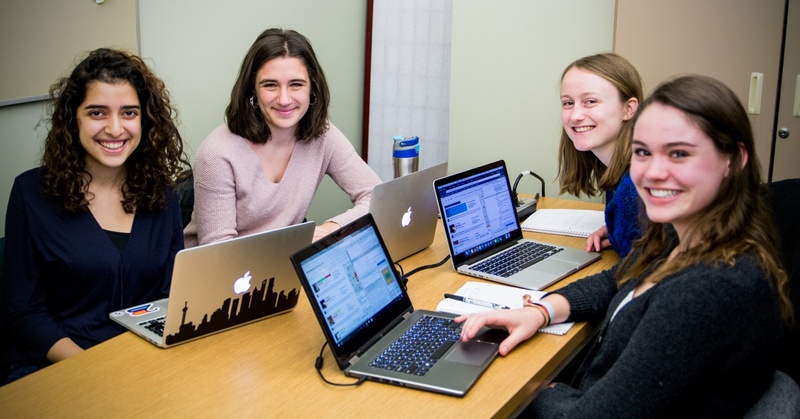 The Carleton College externs (from left): Maryam Hedayati, Sophia Maymudes, Anna Meyer, and Steph Herbers. This December, GroupLens hosted these four undergraduates from Carleton College for a three-week externship to get a taste for a research career in computer science. During this time, they had opportunities to get to know graduate students, network with faculty, participate in experiments, attend research presentations (including two thesis defenses! ), and work on this social computing research project. Chicken wings poorly reviewed? Not too surprising. Come to Buffalo for real wings. The secret is in preparing the chicken prior to the fry and dressing them in proper sauce that balances vinegar and pepper.